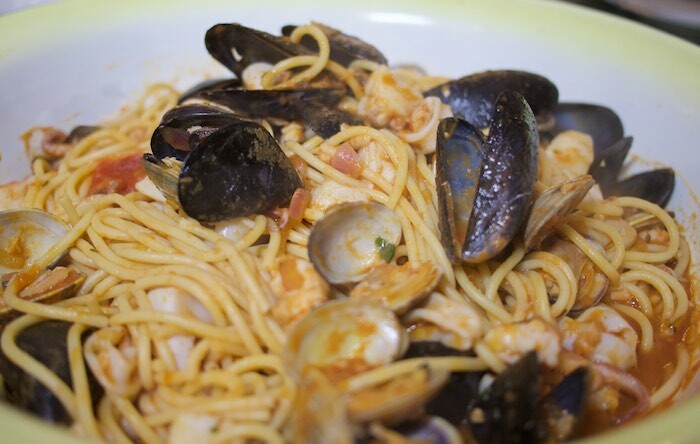 One of my favorite meals to order at an Italian Restaurant is the seafood pasta. Whether they call it cioppino or pescatore, I love a big bowl of pasta topped with mixed seafood in tomato broth. Until recently I had never made this at home. It was something I always thought was too entailed to attempt in my own kitchen. Nothing could be further from the truth. Pasta with seafood is one of the easiest dishes to prepare. The tomato base is made in advance with the seafood being added in stages as the pasta is cooking. Honestly, it couldn't be easier to make. Heat the olive oil in a large deep skillet. Add the onion and garlic and cook over moderately high heat until softened, about 5 minutes. Add the wine and cook until reduced by half, about 3 minutes. Add the tomatoes, and clam broth and bring to a boil. Add the crushed red pepper. Add the mussels and clams and cook, uncovered, until the shells are just beginning to open. Add the scallops and snapper and cook until the shells are nearly all opened and the fish is nearly cooked through, 2 to 3 minutes longer. Add the squid and cook until opaque, about 1 minute. Meanwhile, in a large pot of boiling salted water, cook the pasta until al dente. Drain well and transfer to a large serving bowl. Toss with seafood and serve. Looks so delicious & full of flavour! My husband would love this recipe! This will be perfect for his birthday meal! Looks delicious! My husband would love this. This is one of my favourite dishes! Will definitely give it a go! This looks so delicious. I like the addition of red snapper. That looks like a bowl that I would love to dive into! I just saw some gorgeous red snapper at the fish market, too. We order this every time we go out. Now I'm making it at home! Thanks for sharing! Pasta + seafood = HEAVEN!! I love it! This looks fantastic. I love ordering Italian out, but Italian at home is even better!